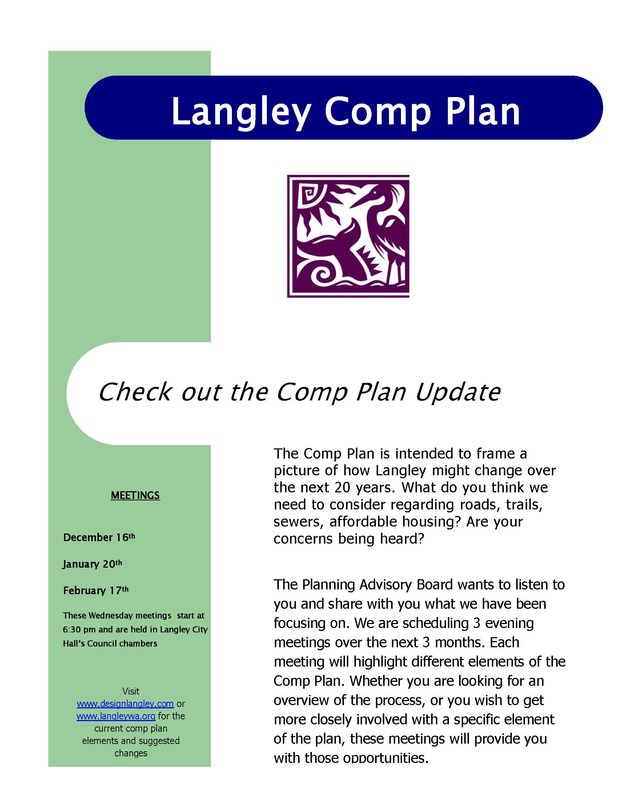 The city of Langley has begun to update the comprehensive plan to be completed by the summer of 2016. This “periodic update” is required by state of Washington law and will include many opportunities for public involvement. The Planning Advisory Board (PAB) will be facilitating the process for public input in partnership with the Department of Community Planning. We hope to use this website in conjunction with formal public meetings, charettes etc. to increase public participation, provide information and receive feedback with regards to the update throughout the update process. We will be discussing ALL elements (listed below) to date and taking any feedback from you, the residents of Langley. You can click on the links below to access the final draft elements as they become available.